In today’s People.com, we see another installment of an endless series of articles in one of the countless dailies that purport to rank or list famous beauties on the basis of one characteristic or another. You have to admit that when they’re not annoying or totally off the wall, they’re sometimes amusing and, every once in a while, interesting. I’m not sure what to make of this article. 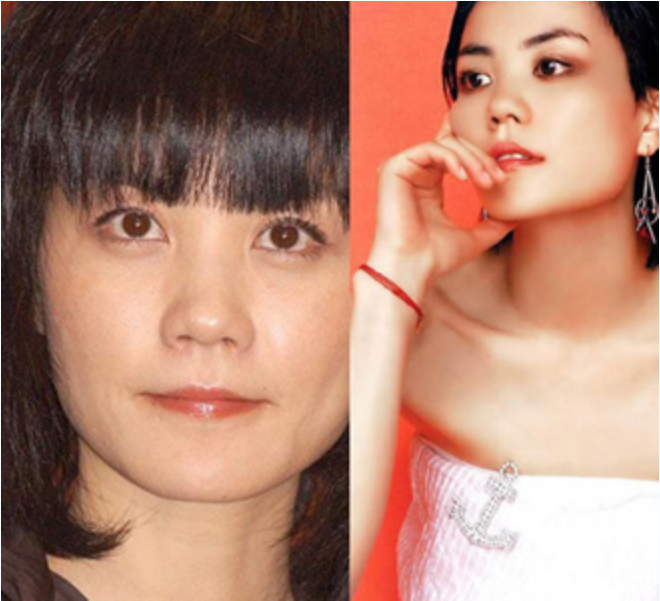 Usually, they begin with Faye Wong (王菲) and include other prominent stars. In this article, they include Vicki Zhao (赵薇 Zhao Wei), her close friend, and Cecilia Cheung (张柏芝), the wife of Faye’s ex, Nic Tse (谢霆锋). At other times, they also include Faye’s other good friends Carina Lau (刘嘉玲) and Na Ying (那英). The point of these articles is to get the readers’ attention, which ia always good for the media business. The fact that Faye is always at the top of the list and her name is always included in the title says a lot about her appeal. The magic formula is (1) mention Faye first and (2) include a photo of her and you have an instantly popular article. What’s interesting about this article is the point they’re trying to make — that makeup makes a tremendous difference in the beauty of stars. In this case, the writer says that Faye doesn’t look very good in the photo on the left but looks terrific in the photo on the right. But I think he just chose the wrong model to make his point. Faye is one of the few stars who looks just as great without as with makeup. Frankly, she doesn’t need makeup. She’s a natural beauty. She’s beautiful with or without. Period. All you have to do is look at her photos and videos. And these comparison photos are a good example of Faye’s beauty. Stunning on both sides. I agree that this is definitely a joke of an article. The biggest jokes is that they compare a semi-candid Faye shot straight on with a heavily airbrushed pro-shot at a complimentary angle. Yeah, you’d think when they do an A-B comparison, they’d at least try to get shots that are similar except for the makeup. Instead they compare A and Z photos that are already drastically different — never mind the makeup. LOL! i don’t see anything wrong with the pic on the left~ still pretty. Haiyu~ the author thinks celeb sleep with their make-up on meh? but i agree, at least they should use a candid shot of faye with make up at events instead of one for promo use.